Builder Scott Young adapts the traditional Scottish longhouse to create his own home and offers its design concept to others. 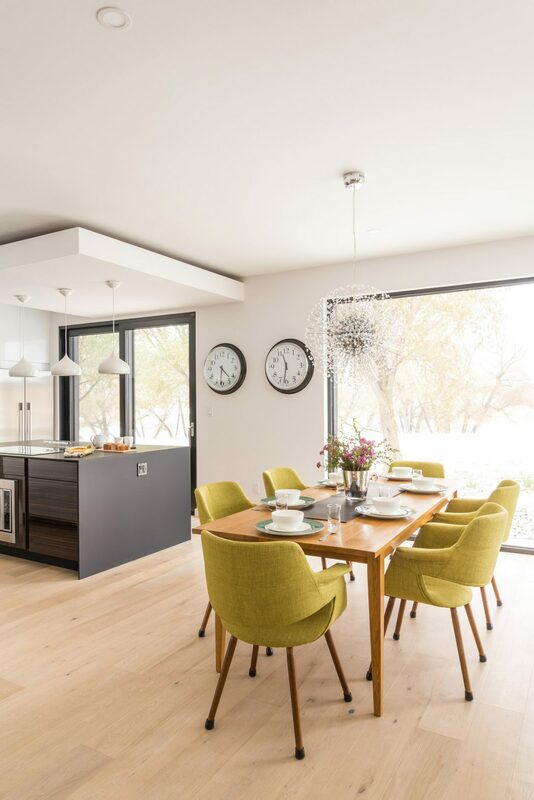 There are two clocks in Scott and Lynn Young’s kitchen/dining area: one tells the local time; the other is set to the time in Scotland. “It’s so that when you’re phoning home, you know what time it is, and you’re not waking the mother-in-law,” Scott Young jokes. Scottish time isn’t the only thing Scott has imported to Canada. 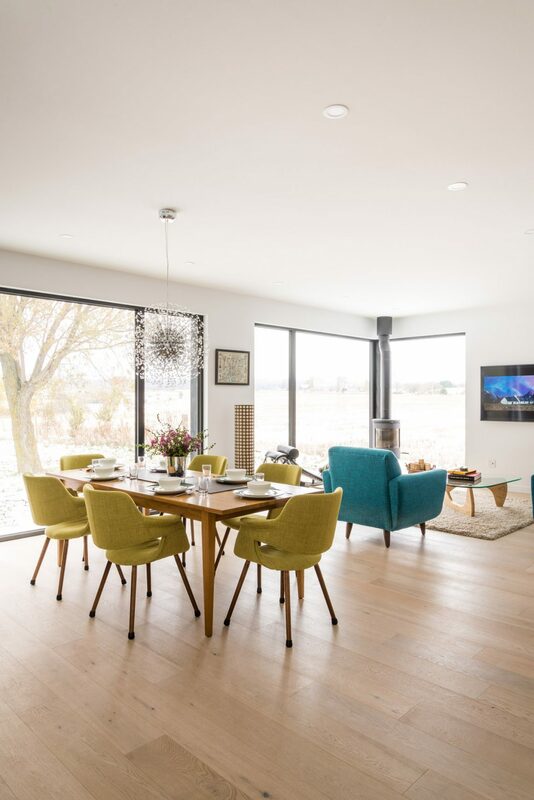 The owner/builder of Scot-Build Developments Inc. has started building a line of homes modelled on traditional Scottish longhouses in the Collingwood area north of Toronto, including one for himself and his wife in Clarksburg, The Blue Mountains. For hundreds of years, longhouses were built in the Highlands as farm homes, single-storey stone buildings with an earthen floor, thatched roof, and a fire pit and chimney in the middle for cooking and warmth. In the harsh winter months, the family would even bring their cattle inside to keep them warm and healthy. A dropped ceiling defines the kitchen area. The cabinetry is by Kitchen Craft from Knights Building Supplies. The upper cabinets are flush with the lower units to give the kitchen a clean line that Scott particularly likes. 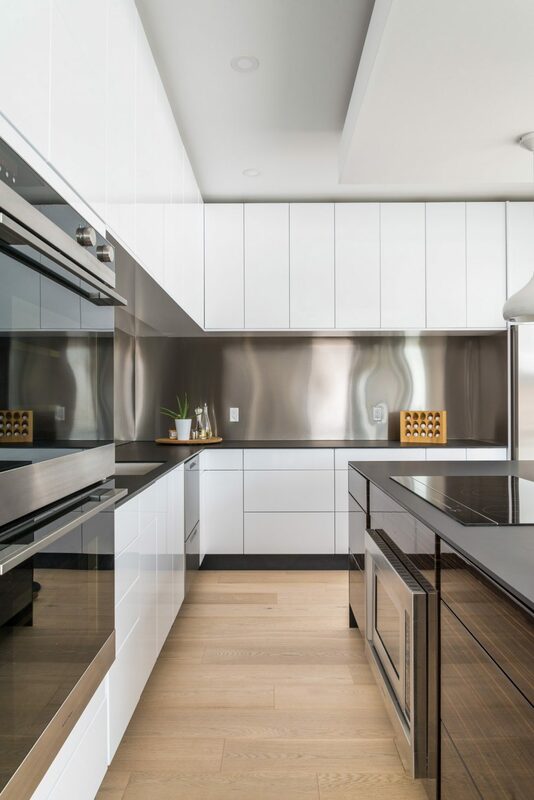 A stainless-steel backsplash reflects light. Appliances: Fisher and Paykel; white pendant lights over the island: Home Depot; stools: Structube. 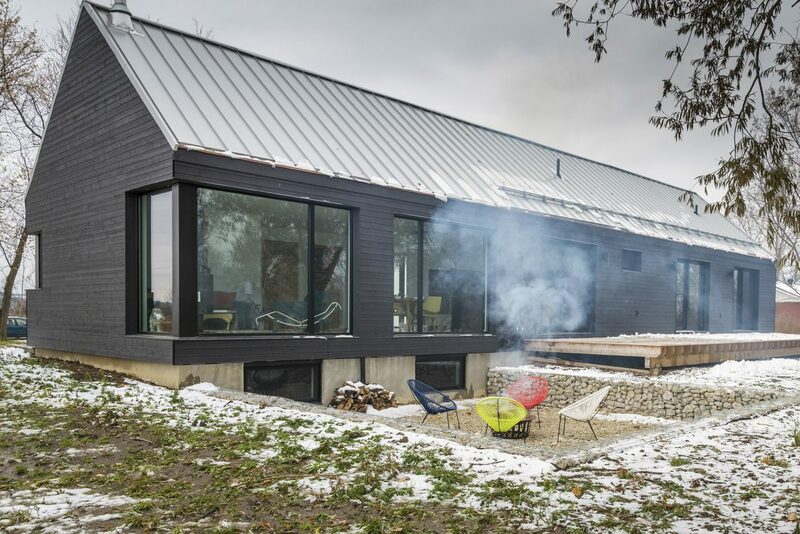 That long, low, practical building was the inspiration for what Scott calls the “modern longhouse,” which his company builds in six different models and floor plans. 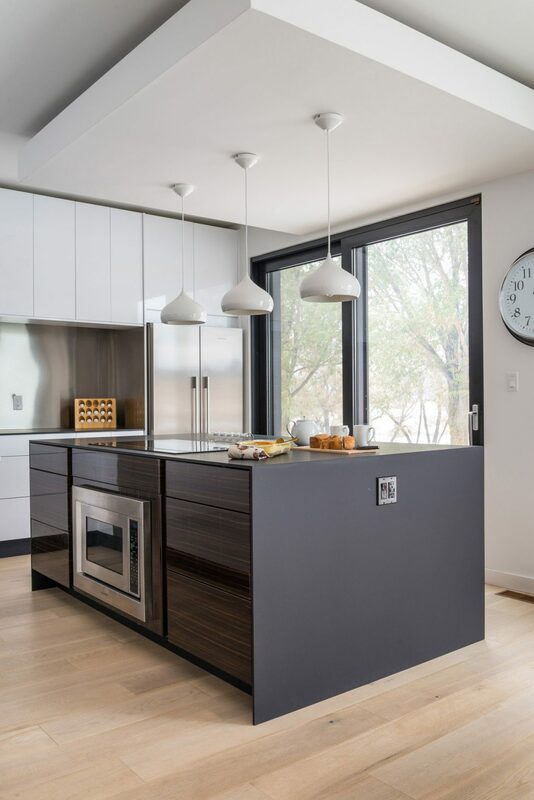 Instead of very small or even no windows in the traditional building, this new version has huge windows, an open floor plan with a modern, minimalist straight-line design and northern European styling. Scott’s home, the Longhouse model, has a main-floor open living space, two bedrooms, two bathrooms and a powder room, an office and a garage in an area of just over 1,800 square feet. Scott and Lynn have nicknamed their chandelier “the exploding Death Star” from the Star Wars movies; it’s from Union Lighting in Toronto. Table: IKEA; Langley Street chairs: Wayfair. There’s a large deck off the back of the house. The finished basement has two more bedrooms, a full bathroom, and an entertainment space with a bar area. Instead of the historic building materials of earth and wood, construction starts with NUDURA ICF (insulated concrete forms) foundations. “It’s like Lego blocks, and it’s just highly insulated,” Scott says. Hydronic heat is installed in the floors. Outside, the front door entrance area is recessed, with the bottom stair flush with the main exterior walls. 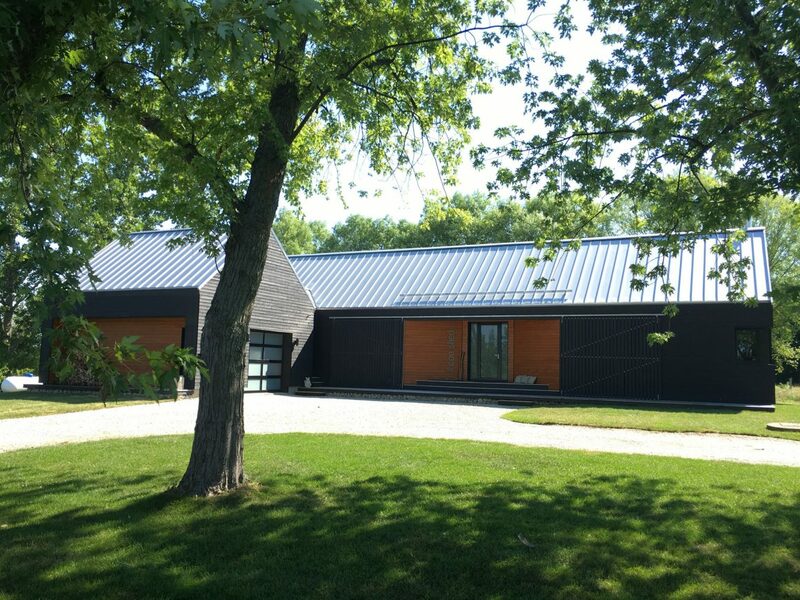 In another nod to the Canadian climate, large black barn-type doors on the outside walls can slide over that recess to shade the front door in summer. In winter, Scott and Lynn close them if they’re expecting heavy snow. “When they’re closed, it looks like a cow shed or an agricultural building,” Scott says, in a look that’s reminiscent of the traditional longhouse. The house is topped with a metal roof, with no overhang or soffits. “In cottage country, some folks like the stone look and dark flooring,” Scott says. While those homes can be quite cozy, he says, the longhouse models, “are made to be light and airy. 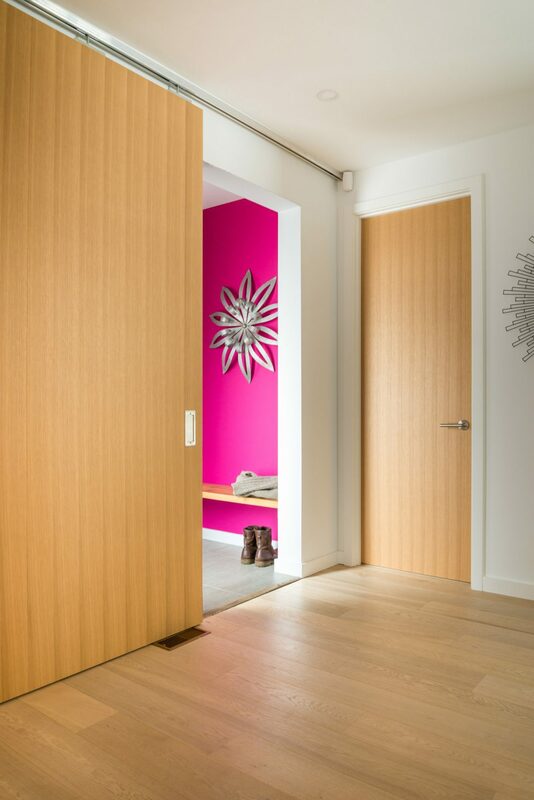 These are a very different look.” Part of that airiness is achieved through the use of light-coloured wood. 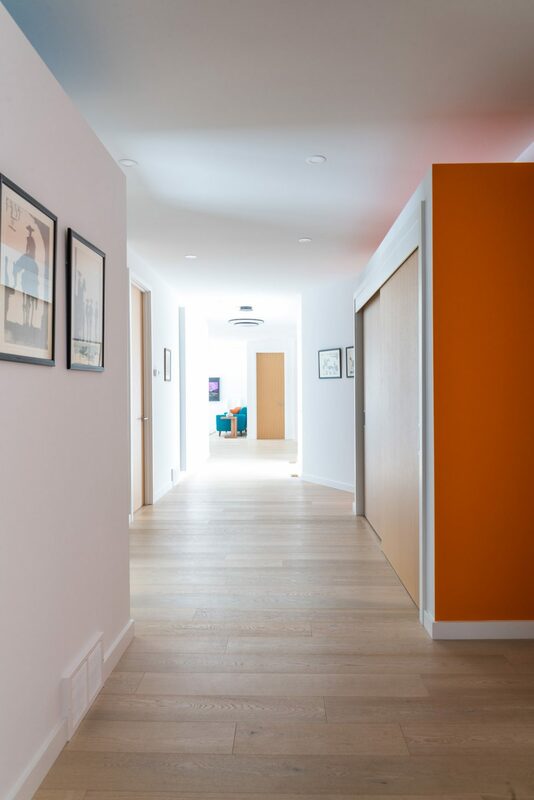 The floors are blond oak engineered flooring; the doors are eight-feet-high white oak. The lines are clean, without heavy or ornate moldings. Combined with the home’s large windows, the materials seem to invite the outdoors inside. The view is so great and the neighbours are far enough away that the Youngs don’t bother with window coverings. 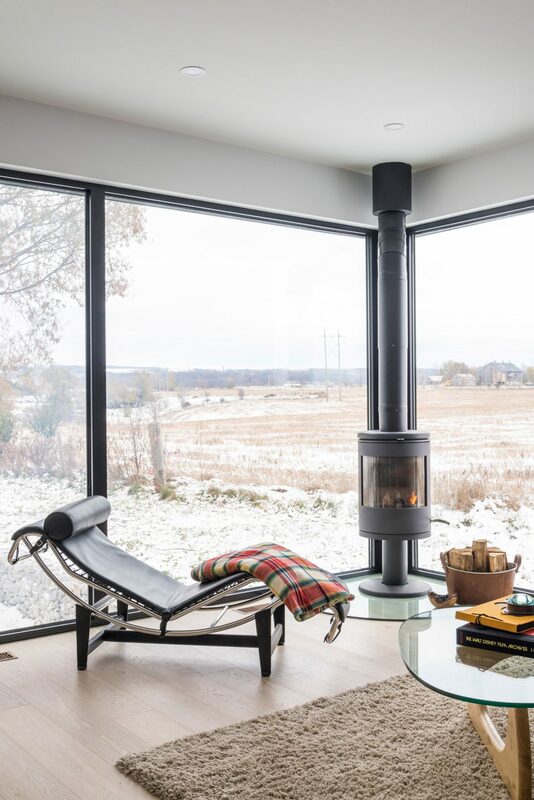 The huge windows are by Tiltco Fenestration, and the wood-burning stove is from Chantico fireplaces. Corbusier chair: Mobilia; Grampian coffee table by Wade Logan: Wayfair. 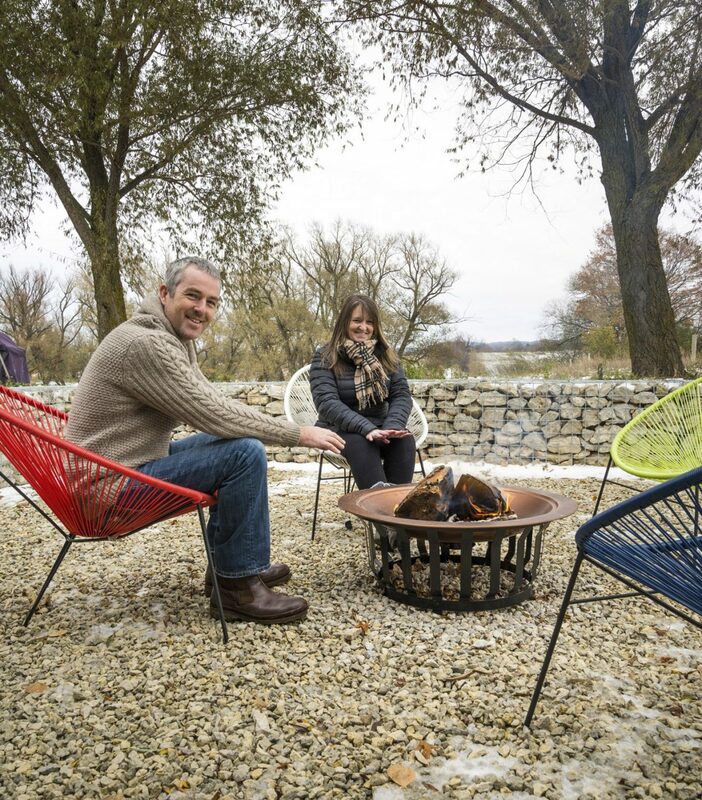 Appreciation of an outdoor lifestyle is part of the reason Scott emigrated from Scotland almost a dozen years ago, when his two children were in their teens. The family first lived in Thornbury and Mississauga, but he always felt it was too much like the urban environment they had left behind. So, finally, they built their new home in Clarksburg. He says his favourite part of the house is the kitchen, mostly because of the clean lines. 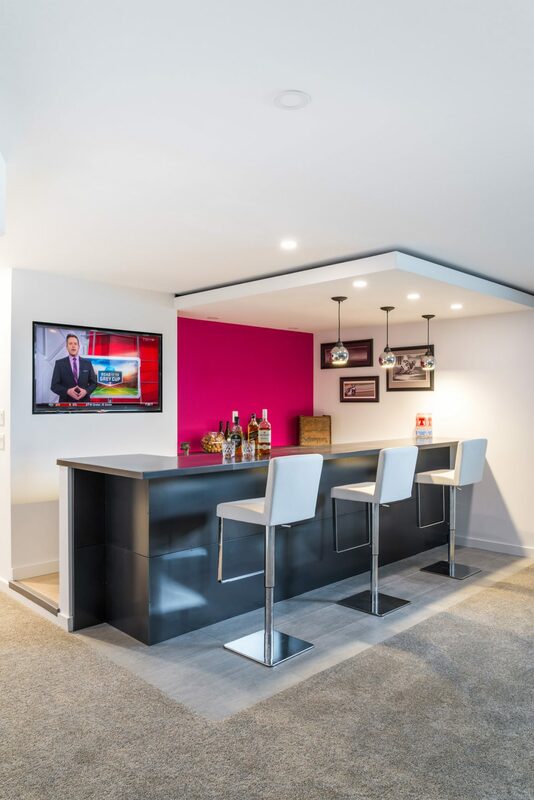 Lynn, he says, was keen for him to finish the basement to have an entertainment and bar area. He was reluctant at first, thinking there would be time to do it later, but finally concluded that she was right. “If we didn’t do it now, it would probably never get done,” he concedes, adding that it definitely adds to their enjoyment of the home.